You’re hosting a special occasion. You want to give your guests the best, most memorable organic food you can afford. You also want to satisfy your inner CFO by getting the biggest bang for your buck. We all know that fresh organic ingredients are the tastiest, but would it surprise you to learn that when you work with a great organic catering company, the cost can be the same, if not less, than traditional catering? Whether you’re planning a family reunion or catering a corporate event, delight your guests with delicious, healthy catering menus that won’t break the bank. Let’s talk about quality. Organic ingredients are grown more slowly which gives flavor time to develop. Organic vegetables also are grown without pesky pesticides and fertilizers so they’re stronger and have greater nutrient uptake than their non-organic counterparts. It’s also thought that the chemicals released by their more robust defense systems contribute further to more intense and complex flavors. You are, in effect, getting twice the taste for your dollar. When those ingredients are locally sourced (as we do as much as is humanly possible from local farmers and markets) they’re at their peak when they hit the pan. This ensures the taste is bolder and brighter than any wilted non-organic ingredients flown thousands of miles. Subsequently, our chefs can often do much more with less. Organic meat and dairy products, aside from being ethically raised without growth hormones or antibiotics, also have a superior flavor so need less salt and interference by our chefs to tease out the mind-blowing taste. Food waste is a huge issue, but how often does it cross your mind when you’re planning food for an event? We’ve been in the catering industry for long enough to know that all too often masses of leftover food from events is simply thrown out. At the other end of the spectrum, we’ve even seen inexperienced caterers run out of food on the day. The solution? Proper planning and portion distribution. We’re sticklers for precision. We don’t do unnecessary frills. Everything on your plate is carefully considered and contributes to the dish or it’s shown the door. You’ll find that we also plan portion sizes in nitpicking detail (always generous, never gluttonous) and ensure that each event is properly staffed so that all of your guests get to enjoy the feast equally. What’s the big deal? Well, aside from the ethical issues of food waste, it means that when you work with a good local organic catering company with years of experience you only ever pay for food you eat. Creating incredible dishes, indeed food moments, that transport your guests without costing the earth is our passion. We never (ever) compromise on quality. Unlike other catering companies in San Diego, we keep our own costs low by applying the same sustainable principles to our business. That means we won’t hand you a weighty brochure, business cards, and the usual paraphernalia because we strive to minimize our environmental footprint. We use our resources wisely. We nurture relationships with local suppliers to get the best deals and invest in our local communities. When we see an opportunity to save, do we pass that onto you? Hell, yes. You’ll know that many of your guests choose organic produce for their families, be it for health or ethical reasons. Some of your friends or clients may also have food intolerances or dietary issues. While not a direct financial cost, when you want to impress it’s hard to make a case against healthier, tastier, sustainable catering. It’s guilt-free food that sends all the right messages that you care. Another benefit of eating organic lies in its value to your community. 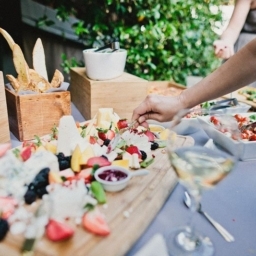 Ever wondered why organic catering in San Diego is so darn good? It’s because California has the highest concentration of organic farms in the U.S. It produces over 90% of our nation’s organic walnuts, lemons, figs, artichokes, almonds, and dates. For event catering in San Diego, it’s a chef’s dream. We have our pick of the best berries, lettuce, chickens, avocados, oranges, strawberries, plums…(you get the picture). By sourcing produce from those legendary local farmers and suppliers, we pass your hard earned dollars into a sustainable agricultural system that’s good for everyone. So not only is organic event catering an affordable, cost-effective option, it also gives you a way to put your money to work for the things you and your guests value. You get to feel good about treating the people you love to a sublime, guilt-free meal, and you also feel warm and fuzzy knowing that you’re investing in people who’re doing their bit for a better world. When you choose organic catering services in San Diego, you’re saying ‘no’ to nasty chemicals, hormones, and GMOs that have no business being on our plates. And a heartfelt ‘yes’ to the war on food waste, big flavors at a fair price, happy farmers, and creative menus that are positively good for you. Not to mention, your guests will appreciate their delicious meals and healthy menu options!